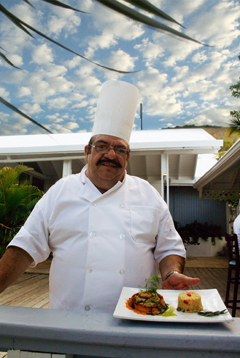 During his extensive career in the Culinary Industry, Chef López has worked in various places. Born in the French Catalonia, he was always inspired by his mothers cooking. "I was always in the kitchen with her. By the age of 13 I was already working at a restaurant with my friend Daniel, he was in charge of the kitchen at his in-laws' hotel", says Chef López. This friend turns out to be renowned Daniel Vasse from Chez Daniel Restaurant at Palmas del Mar in Humacao. Motivated and hungry -for knowledge that is- he set out to work in various restaurants to master the craft. Then, after studying in Toulouse, working in the Méridien Hotel in France, at the restaurant of the Eiffel Tower, and moving to work for three years at a hotel in Saudi-Arabia, it was his friend Daniel who asked him to move to Puerto Rico to help in the opening of his restaurant in Palmas del Mar. Twenty-five years later, he’s still here. But back to that menu… It changes twice a year, however, he develops monthly seasonal festivals, like the Red Snapper Festival, which is going on as we eat. During our dinner we’ve tasted amazing dishes, all worth mentioning. The most creative: an amazing melon colada (a refreshing frappé made with cantaloupe), the most delicious quesito on the planet (did I say this already? ), a green salad with brie cheese and raspberry dressing, scallops with mango, ginger and lime mojo, a snapper filet pionono (made with plantains) with cilantro mojo and mushroom rice, and a juicy churrasco stuffed with peppers. His style has been characterized as a nouveau-latin cuisine. 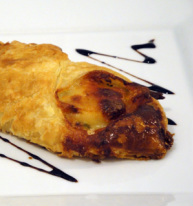 "I try to create a fusion between my French cuisine but with Caribbean ingredients; coriander, tamarind, guava. Of course I've always had the paella in my menu, because the paella (saffron rice) is not Spanish, it's a Catalonian plate. In the Catalan language paella means pan, which is where you make this famous dish", explains Chef López.